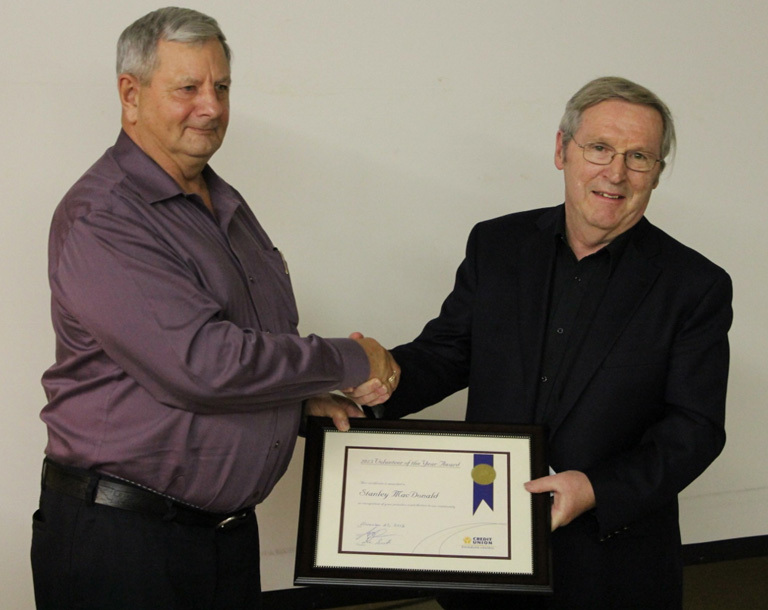 At its recent Annual General Meeting, Évangéline-Central Credit Union announced this year’s recipient of the Volunteer of the Year Award. This year’s recipient contributes significantly to the community he was raised in, McNeills Mills, and has resided in O’Leary since 1965. He loves his community and is well respected by residents for his involvement in key fundraisers, community events and his overall supportive nature. Volunteering is an ongoing skill that he has been practicing since the 60’s. He has served on the former Unit 1 School Board, on the UPEI Board of Governors, as past President of the PEI Pharmacy Association, and as Chair of the O’Leary Village Council in the late 60’s which he now presides. He was a Director of Juice Works, Vice-President of the Maple Leaf Curling Club, served on the St. Luke’s Kitchen Party Committee and was past Director of the PEI Community Foundation. Stanley has been a credit union member since 1969. He has served on the credit union Board of Directors, has been past President of the O’Leary Athletic Association, a member of the PEI Tourism Association and has served on the O’Leary Community Hospital Board. He is presently Director of the O’Leary & Area Development Association, Chair of the Canadian Potato Museum, and on the Parish Council for the Anglican Church of O’Leary & Alberton. He is a founding member of PEI Potato Blossom Festival and is currently a committee member. He has played a crucial economic role in the community as he owned and operated O’Leary Pharmacy from 1965 to 2008. He is not only known in the community as a volunteer and business owner, but also as a loving husband to Adrienne and a very devoted father to Heidi, Bethany and Jill. Please join Évangéline-Central Credit Union in congratulating their 2013 Volunteer of the Year Award recipient, STANLEY MACDONALD. As recipient of the 2013 Volunteer of the Year Award, the credit union recognizes Stanley’s leadership, time and commitment to the community. On his behalf, they will present a $500 donation in his name to a non-profit local community organization of his choice.